This house is situated in a gated estate, south of the prominent eastwest ridges that topographically define Johannesburg. For many residents of the city, the environment north of the ridges is the 'real' Johannesburg, while the area south of them is an unknown entity. The view from the site is towards these ridges, on the northern horizon line. The site has a slight fall - just enough to capture and emphasise this view by means of the section of the building. When one looks at the architects' conceptual drawings, it becomes clear that the section was the main starting point and obsession in the design. Upon entering the house, the view is again emphasised. The planted roof of the lower floor becomes the base of the view, creating the illusion that one is in a rural area. In fact, much has been done so that the views are framed to support this illusion, while the real context is a suburban gated estate. The two forms constituting the house have a certain tension between them. 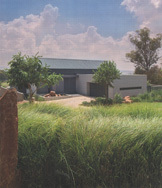 The form of the higher-level one has a barn-like appearance, effectively also creating a privacy barrier for the site. The form on the lower level is flat roofed. The way that this latter form opens up to the water feature in the courtyard - and towards the garden space in the north - enables it to virtually disappear from the viewer's experience. This house has been beautifully built and detailed. Every decision and detail of the architects bear testimony to their careful and considered thinking.